We love to hear from our customers... Please leave a comment or reply below in our Blog! Dangler tip down is by far better than any system I have ever used!! Hook up ratios went from 30percent up to 95percent! I’m a big tip down guy, especially to help the kids catch fish. What’s the advantage? You can reel them up and feel the fight. No line mess on a cold windy day, like yesterday 4 degrees and 15 mph winds. I own 4 tip downs and 3 danglers, one being a trip-up. Going to buy another one or two yet this year before the next trip up north. The only short fall to the trip-up is it’s tricky to set up on different rods until you get used to it. Buy a couple Velcro straps to make it easier for multiple rod use. Game changer with finicky fish. Love its compactness, portability and ease of use. Plus, you get to use your own rods! I’ll never get caught on the ice without one (or two). Great product very easy to set up and use. Needed to contact the company about an order I placed and received an email almost instantly after I send it. Great customer service. I will let everyone that I know to add the Dangler to their ice fishing arsenal. Thanks! My brother-in-law bought me one of these a few years ago- I swear by it, I’m positive I catch more fish with it and think it’s cause it jigs live minnows better than I ever could. I’m happy to see Cabela’s is selling it, but it’s bittersweet knowing once others use it this product, it will blow up and my secret weapon won’t be so secret. My family loves the dangler, by far the best rod holder on the market. I’m suprised the bigger retailers don’t stock them. I got my first combo have used twice now. I loved it in my hub was ease to use, was great not to look over if bobber had gone down. Plus with flag up knew I had a hit that only happen once all the other times caught the fish. I have not try it outside yet because of the below 0 weather here in ND last couple weeks. Hoping next week will be able to try outside. I just order some more combo’s with girlfriend going a long to use. I would love to see company make carry case for them so flag system would stay all in one place, like a 3 or 4 rod holder case. I will be sending my ideal to company. I recently purchased 3 of the Dangler Straps from the Dangler website. I had a question about my order and used the websites CONTACT section. I got an immediate response from Brian at Dangler answering my question. This small company is committed to its customers and it shows. Also the Dangler Rod holder seems like a basic design but I love the fact that the arm holding the rod flips up so you can just grab the rod and set the hook quickly without first having to take the rod off of the arm. I also like using my own rods vs. the standard tip down rods like other models without a reel/drag. Fighting a big crappie with a drag is way more fun than hand lining it to the ice. Dangler will get more business from this happy customer! I’m going into my second season using the Danglers (I have two) and I really believe the Danglers have improved my catch rate. I typically use one as a deadstick holder in the shanty and the other just gives me a break from jigging now and again. I was previously using rod holders that required you to move the rod forward out of the holder before setting the hook and I’m positive that slight movement was causing me to miss wary, cautious fish. With the Dangler, when you see the bite, you can just “grab the rod and set the hook!” No forward movement of the rod is necessary. I’m sure I’m putting more fish in the pan because of them. They set up and take down in seconds and fold up nice and compact so they don’t take up any precious room in the sled. Great product and I wish I had had them years ago. This product is great for all ages! I loved getting my sets for Christmas years ago, I always have them in my rod bag ready to go! I’m still amazed how the fish will hit the Danglers over any of us jigging a couple holes away. Everybody needs to try the Dangler and the Dangler Trip-Up. If you use this set up with a hole cover you can fish in below zero temps and not have your line freeze up. 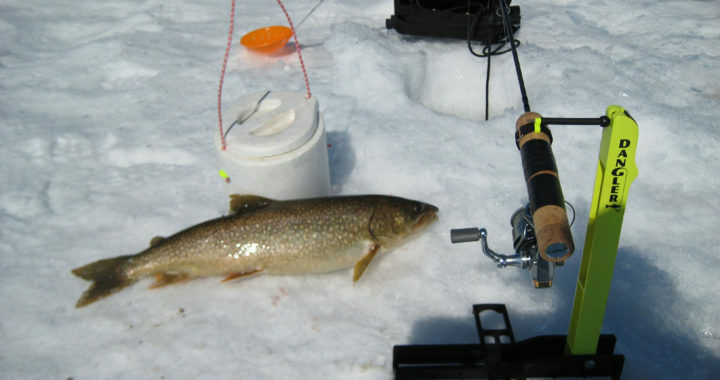 We’ve caught everything from Walleye, Crappie, Pike and Lake Trout on the Dangler and Trip-Up. They are easy to set up and you don’t need a lot of room to get them to your fishing spot. Dangler folds up and fits in your side pouch of your rod bag and I put the Trip-Ups in a small plastic case. I’d make sure you watch the set-up video of the Trip-Up so you understand how to set these up. It’s not hard once you set it up a couple of times. A lot more fun to reel them in rather than hand over hand!